Very nice villa near Pampellone beach . 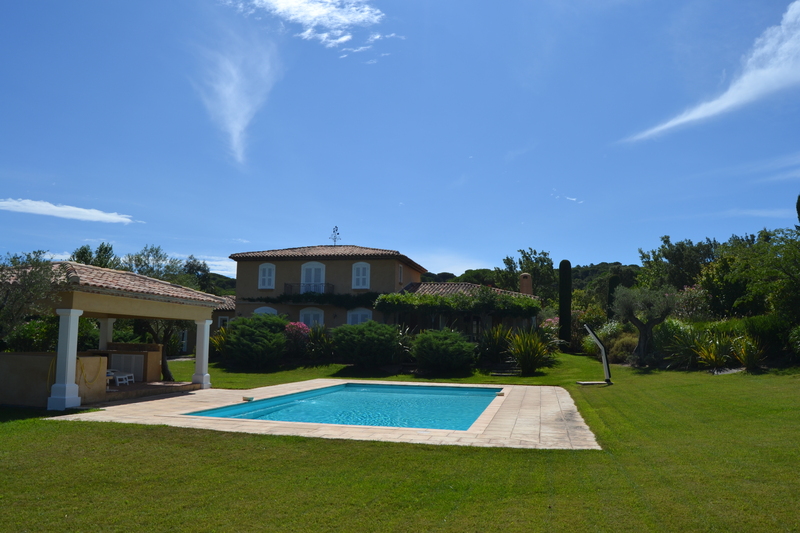 This 500 m2 villa on 1 hectare of land situated in an elevated position with magnificent views over the surrounding hills, sea and vineyards offers a possible 7 bedrooms plus and undependent cottage. The beaches - Panpelonne beach, club 55 ...- are easier to access from this area without traffic problems and can even be reached in 20 minutes by walking or 4 minutes by car. There is a swimming pooland separate Jacuzzi. There are 7 bedrooms, 2 below the swimming pool, 2 sharing one large bathroom close to the pool and 3 way from the pool, plus a summer kitchen area with shower and toilet directly close to the pool. The lounge is on the top floor with chimney and dining room is a splendid size with large sliding glass doors offering superb views of the valley and central electric shutters for protection from the sun. This opens onto a large terrace with barbecue and sea view. Also at this level is the quest wc, an office area with internet connection and a separate modern kitchen fully equipped and including a breakfast table.